Jochen Pfeiffer is, by almost every measure, the best one-on-one combat player ever. The most obvious measure is that he has spent all but four weeks ranked at number one in the FNC rankings. He also has as many wins vs top 10 players (14) than the next two players put together (Luke Burrage and Iver Tronstad with 7 each). However, the clearest way to show consistency is by remaining undefeated in tournaments. Jochen's achievements in this area are unequalled. All "official" records begin on January 1st 2013. From then until May 2015, Jochen won 28 matches in a row. This is twice as long as the second longest winning streak; 14 matches in a row by Luke Burrage. In terms of rankings points won, Jochen's 28 match winning streak comes in at 5700 points compared to just 1300 for Luke's. In his 28 match winning streak Jochen defeated 18 different jugglers. Among these he beat Luke Burrage five times, Eóin Allan three times, and Fabio Zimmerman, Jochen Hänsel, Emil Lamprecht, Alexander Müller and Matty Schneider twice each. The streak began before 2013, though those earlier matches are in the alpha rankings era so don't count for official FNC records. Jochen's previous defeat came at the hands of Florian Marienfeld at the Berlin 2010 Fight Night. With these nine extra match wins the streak extends to 37 matches and just under five years undefeated. Jochen came one point away from losing on two occasions. Eóin Allan took him to the brink at the Hamburg 2015 Fight Night, leveling the score at 4-4 in a semi-final match, before Jochen took the final point. The video of this can be found on YouTube. Jochen had an even closer call at the EJC 2013 in Toulouse. In the final, Luke Burrage had match point when he attacked Jochen's club and snapped it in half. Jochen carried on juggling, kicked up a spare club into his pattern, and the point continued. Luke failed to win that point, or any of the following points, and Jochen came from behind to win the match and the tournament. The match was a classic, and can also be found on YouTube. Jochen wasn't sure how long he could keep winning. In early 2015 he commented "It's only a matter of time." The streak came to an end at the NJF 2015 Fight Night in May. Jochen and Luke were seeded first and second, and met in the final. Luke had lost all of his previous eight matches against Jochen, a record streak in its own right: most consecutive losses to a single other player. Luke had only one plan. "I'm going to play as conservatively as possible," he told some other players before the tournament, though didn't mention this to Jochen. "If Jochen comes towards me, I will block and move away. When I attack, I will attack only once then move away. I'm not going to put in any effort into making the match entertaining, only into three club endurance." And the plan payed off. Luke made many attacks against Jochen, and while none succeeded, they did keep Jochen at a safe distance. In the first eight points of the match, Jochen made three unforced errors and one drop under pressure compared to only one unforced drop by Luke. Jochen's three successful attacks took the match to 4-4. The final point went to Luke after a fourth unforced error by Jochen. And yet there is another streak, and much longer in terms of time elapsed. Check out this list of EJC tournaments, and see who has won the last eight in a row. That's right, Jochen has won every EJC Fight Night he has entered, from 2007 to 2014. He has a 27-1 win-loss ratio at the EJC. His one loss came in 2008 to Mattis List, but that year the EJC Fight Night was a double elimination tournament, and Jochen went on to win in the final (see video of this too). He's beaten Luke Burrage and Alexander Müller in three finals each, Iver Tronstad one, and in 2008 beat Florian Marienfeld and Mattis List in a three-way final. So even though Jochen's 2010-2015 winning streak has been broken, can he keep winning at the EJC for another year? 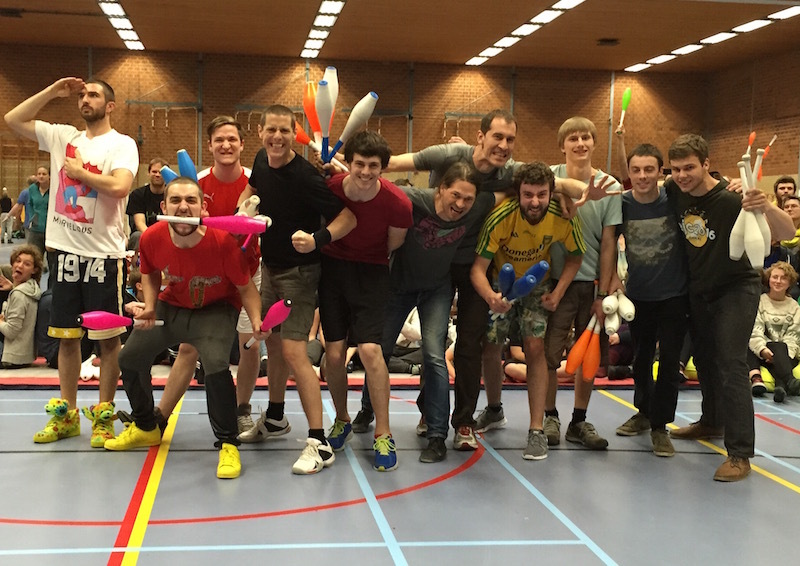 The Nederlands Jongleer Festival 2015 Fight Night took place last Saturday, and it was the biggest tournament of the year so far, worth 750 points. 26 jugglers entered the qualifications and 16 made it to the knockout rounds. This result lifts Luke Burrage back to second in the FNC rankings, swapping places with Iver Tronstad, NJF 2014's winner who couldn't return to defend his points this year. Eóin Allan rises up the rankings to fourth, his highest ever position. Simon À Campo, the only Dutch player to be seeded in the top eight, returns to the top ten.